It has become clear to us that following the demise of the Rattlechain Brickworks that subsequent industrial scale fly tipping occurred around the Rose Lane area- most notably from rogue waste carriers. Only changes in legislation such as The Deposit of Poisonous Wastes Act helped to curtail some of these practices, whilst the local authorities looked the other way. 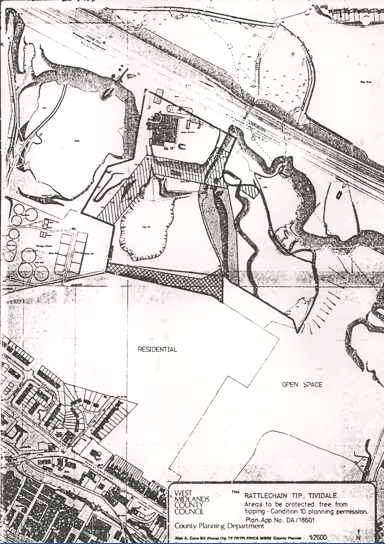 Into this shambles, Duport Properties Limited appeared to come on the scene in early 1973 registering a freehold interest in the brickworks and 2.5 acres on the south side of The Birmingham Canal. There is also the question of whether their infilling of the Vono lagoon also had any permission. 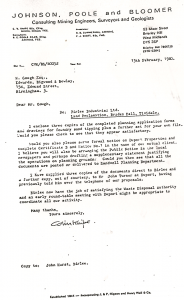 We have looked at this companies interface with Albright and Wilson, and the changing face of John’s Lane HERE. Unfortunately the continuation of tipping at the site adjoining Rattlechain lagoon by Duport Properties Ltd- ultimately through site licence SL129 did virtually nothing to “manage the waste” but leave a terrible legacy of waste to “manage” at a later date- when the original polluter had long fled the scene. 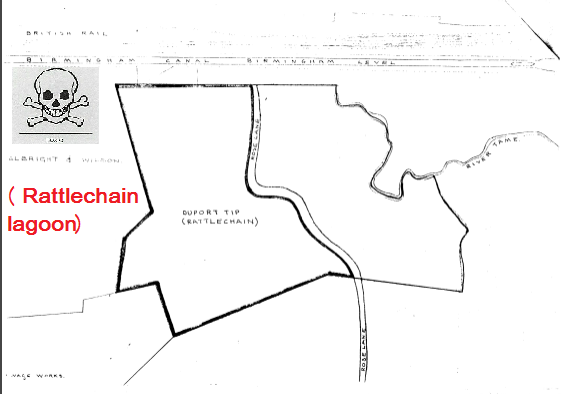 It allowed tipping across the entire site and no longer the infilling of just the clay pit, bordering the Albright and Wilson lagoon which by now had received its own site licence- SL31- “The rattlechain tip”. 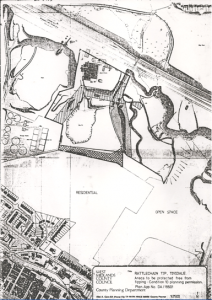 It should be made clear that the only site with the provenance “rattlechain” at this point in time and at any time going forward from this point in time should be the lagoon, as all trace of brickmaking had long gone only to be replaced by appalling tipping operations over the remnants of a brickworks. Unfortunately the mistake in still associating this site as “rattlechain” by subsequent licences and authorities has been misused in trying to link the sites together to suit commercial activities. 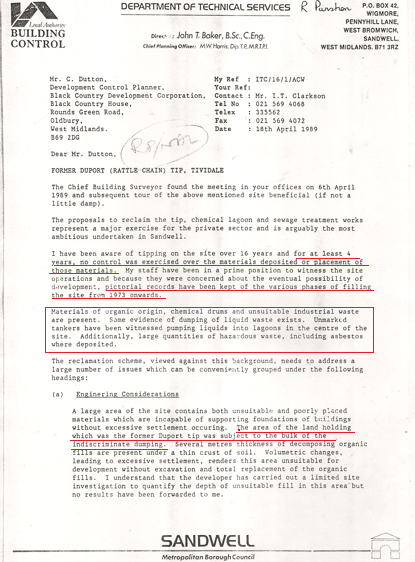 Also in this area was another industrial polluter known as “Birlee Industrial Limited.” As will be revealed below, the two companies appear to be interchangeable in terms of conspiring to fill the site with as much “demolition wastes” as they could. 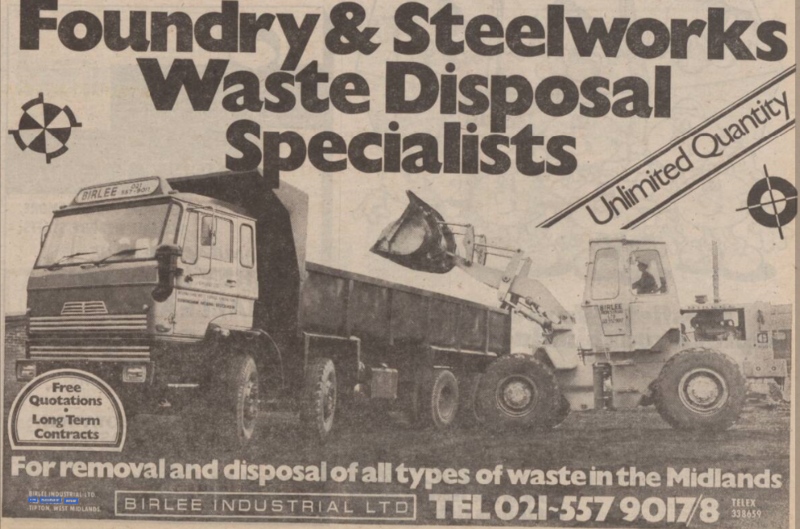 Subsequent to this Birlee Industrial Limited were granted a site licence SL113 which specifically mentions that asbestos waste is not excluded from being tipped on their site, as SL129 had also not excluded either. Subsequent to this, the company then applied for a further extension licence modification to their adjoining site licence SL303. This would be covered with planning application DC11034. 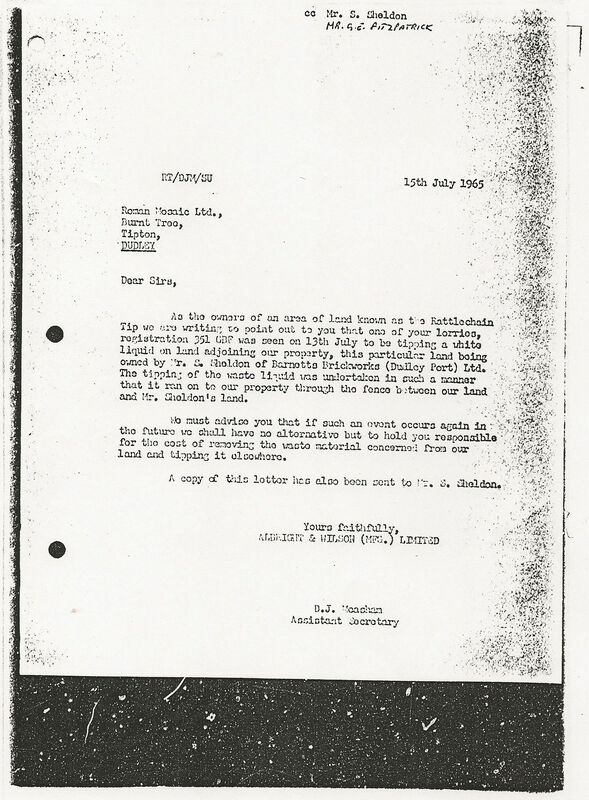 We will look at some of the correspondence between parties of interest below. 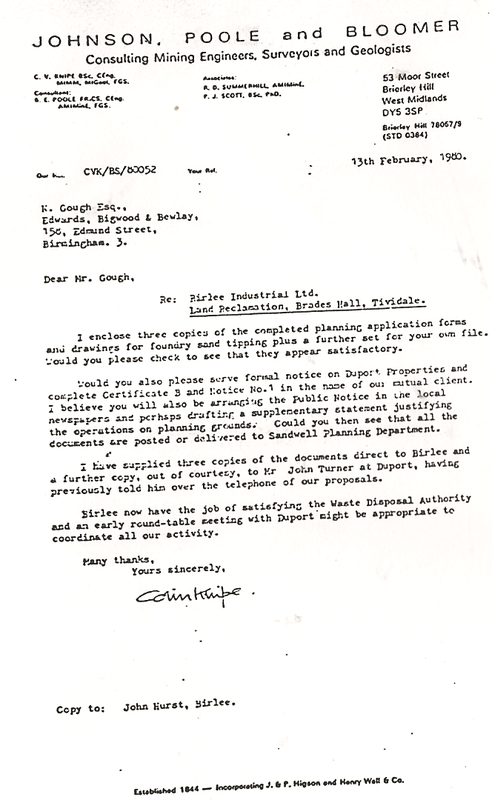 This letter from “Chairman” of Birlee Industrial Limited John Stewart Hurst to consultants Johnson , Poole and Bloomer based in Brierley Hill asks for drawings for fill required on the Duport Properties boundary “as discussed”. This is the first indication of the three co-ordinating their activities across the former “brick works” site. 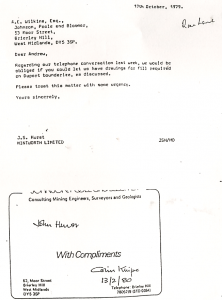 A subsequent letter from the technically retarded Ken Harvey- County Waste disposal officer at West Midlands County Council dated 7/2/80 writes to John Turner of Duport Properties Limited. 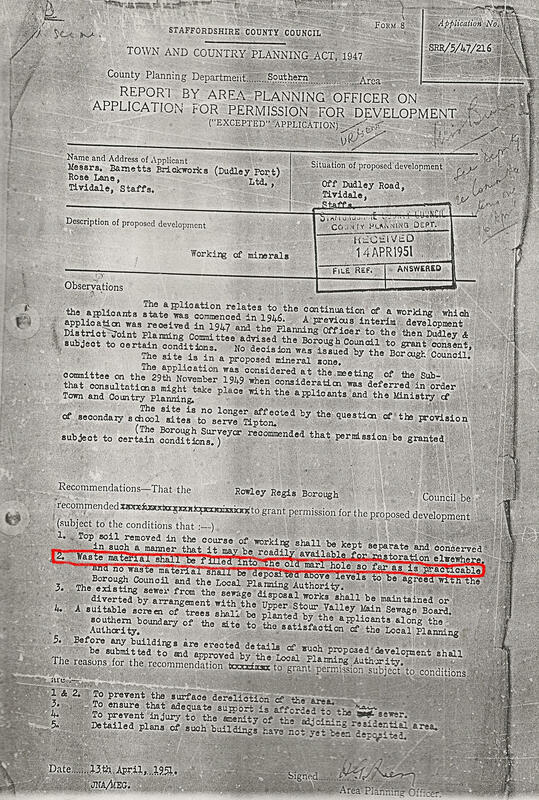 Johnson , Poole and Bloomer had carried out a hydrogeological report on Duport’s “rattlechain site”. Their consultant was named Colin Knipe. Harvey who had already approved 2 modifications to the licence up to this point approved of most of the report except for two points. The depth at which “Grovewood/Vono/Slumberland waste should be tipped” should not be below 128.5 OD He therefore approved of this operation. 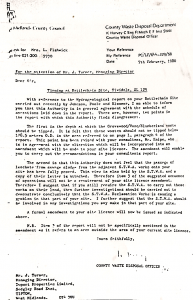 This is subsequently evidenced with the third and final modification to the licence on 11th February 1980 adding condition 44. The other contention concerned allegations from JPB that sewage waste from the adjacent sewage works was leaching onto the Duport SL129 area. As evidenced from the map above, the two sites were directly connected. 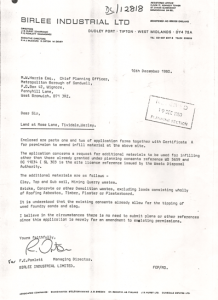 This concerned the necessary planning application for “foundry sand tipping.” and asked that formal notice was served on Duport Properties Limited in the name of their “mutual client” – i.e Birlee Industrial Limited. 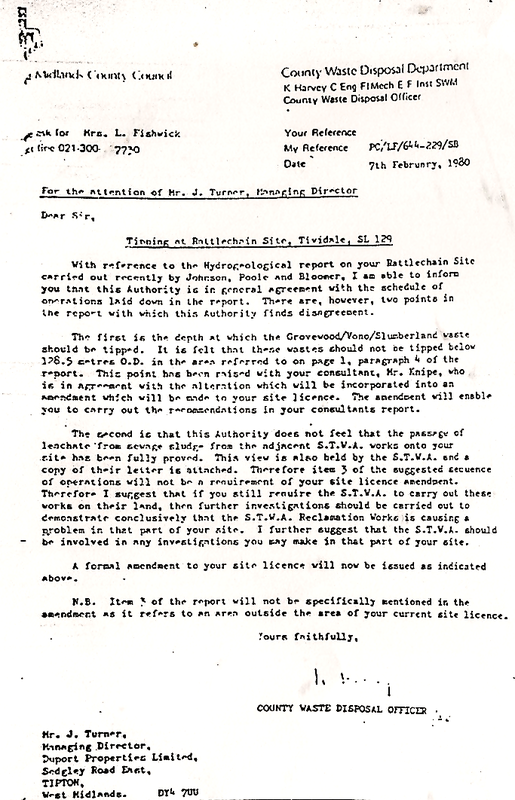 Knipe suggested a round table meeting “to “coordinate all our activity.” Copies were sent to both John Turner at Duport and John S. Hurst at Birlee. 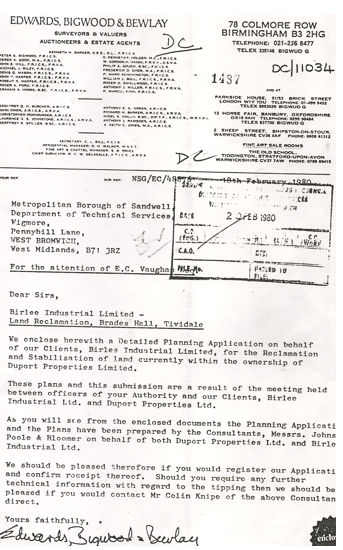 A letter from E B B to Sandwell council dated 20 February 1980 concerned the planning application “on behalf of our clients, Birlee industrial Limited, for the reclamation and stabilisation of land currently within the ownership of Duport Properties limited.” The letter confirms meetings had taken place between the parties and that “the enclosed plans “have been prepared by the consultants , Messrs Johnson, Poole and Bloomer on behalf of both Duport Properties Ltd. and Birlee Industrial Ltd. 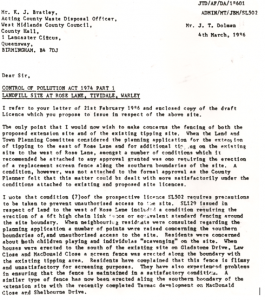 The application DC11034 was approved by Sandwell council on 22nd May 1980. On 20th October Pomlett wrote to a Mr O’Connor (David) at West Midlands County Council requesting a modification for both their licences SL303 and SL313. 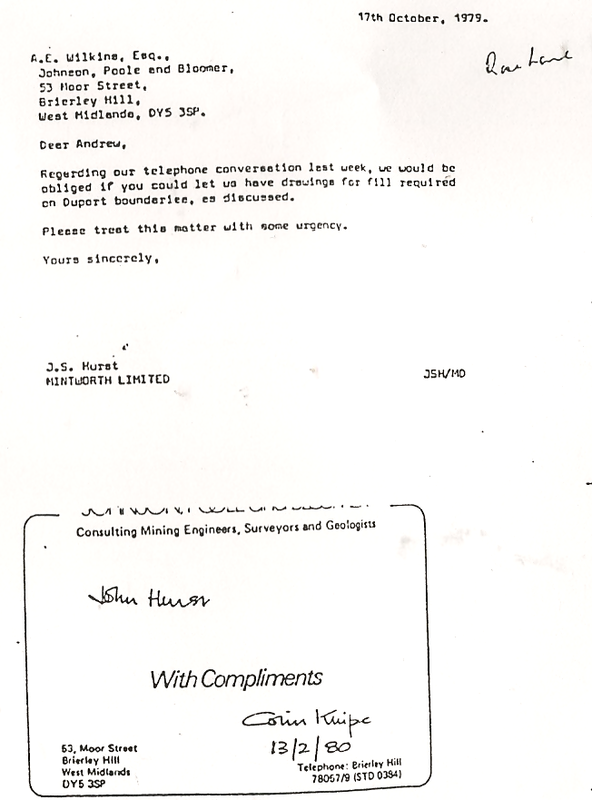 It was decided that this modification needed another planning permission legally with Ken Harvey writing to Malcolm Harris at Sandwell council requesting information. Harris replied on 11th November stating that the council’s legal department considered a further application would be necessary. 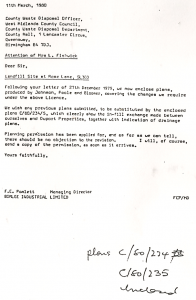 This therefore resulted in an application which Birlee sent to the council on 16th December 1980 via an R Orton, listed as a director of this company for Pomlett. DC 12818 | Tipping of clay, top and sub-soil, mining/quarry wastes, bricks, concrete, & certain other demolition wastes | Land N.E. 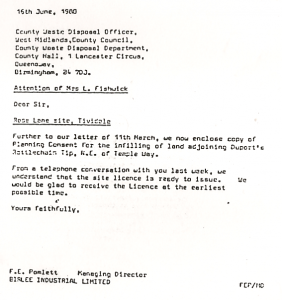 of Temple Way Tividale and was subsequently approved on 7th January 1981. 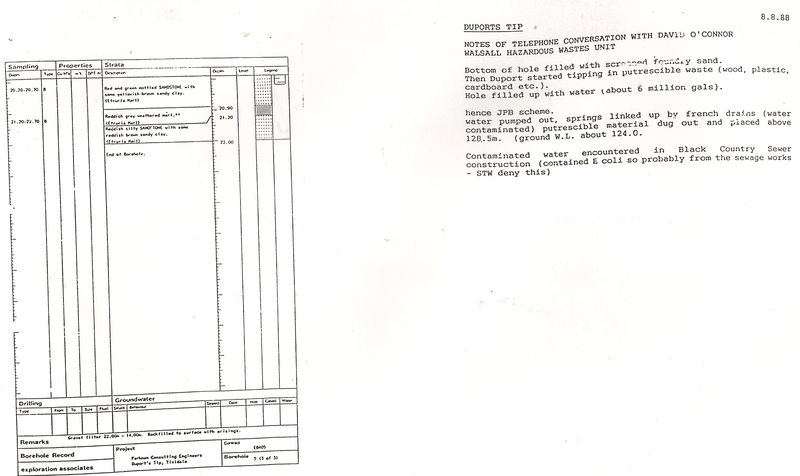 Condition 3 of this application stated clearly that the levels allowed under this should be the same as approved in DC11034 and condition 4, that no liquid or toxic wastes should be tipped- except of course they had approved this already with allowing waste that contained roofing asbestos! 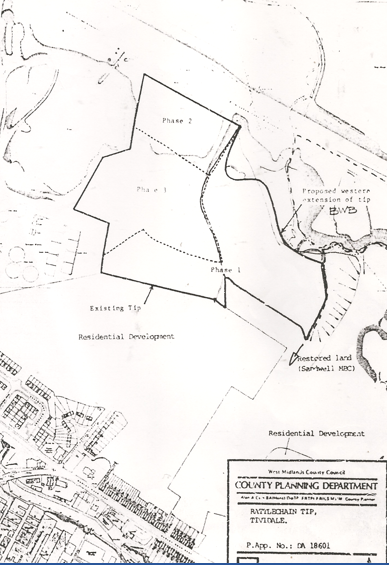 This site covered an area of 10.19 hectares (around 25 acres) of land between recent residential development in Brades Hall and the Birmingham Canal. 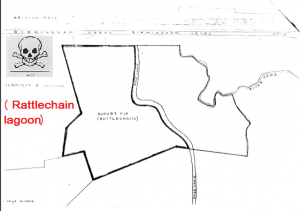 The new area contained 3.2 hectares. 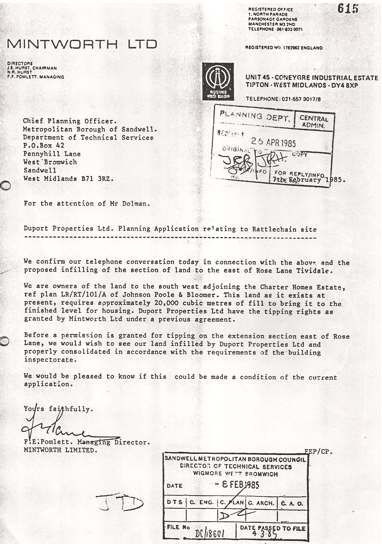 A report from SMBC director of Technical services to the planning committee on 20th Novemeber 1985 fills in the intervening period. 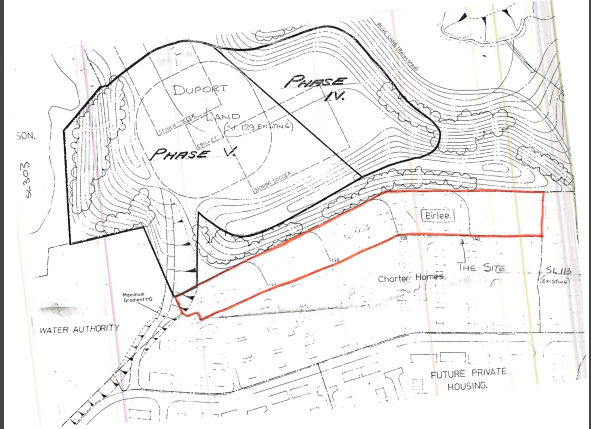 The plans submitted by Duport expressed final levels for land West of Rose lane, a mound and plateau well above the previous ground levels, which WMCC advised them would need an additional permission. Basically then this confirms how WMCC allowed overtipping to continue with impunity at this site. 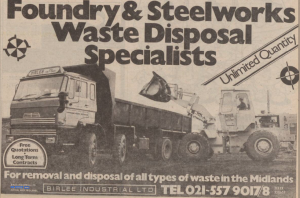 Duport claimed this operation would take between 5-8 years to complete, with the same materials used as for previous tipping, i.e foundry sand as well as all the scrap furniture and rubbish they had been offloading under their prevous tipping activities. 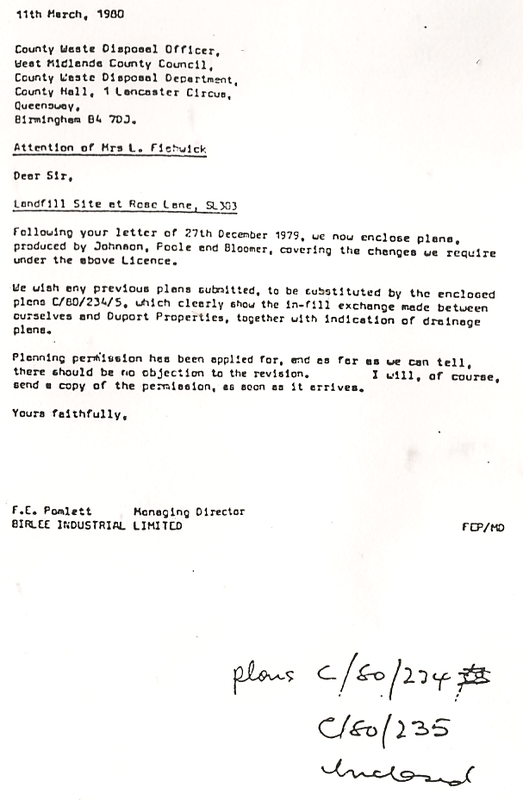 This joint operation over the whole site between the two companies is further underlined by a letter from Frank Pomlett dated 26th April 1985. 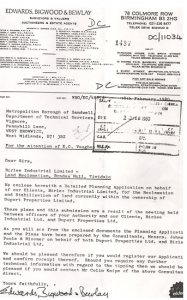 Now operating under the phoenix “Mintworth Limited”, the company is now based at Unit 45 Coneygree Industrial Estate Tipton, (though also claiming a Manchester registered address), with Directors being John S Hurst, N.R Hurst, and Pomlett. 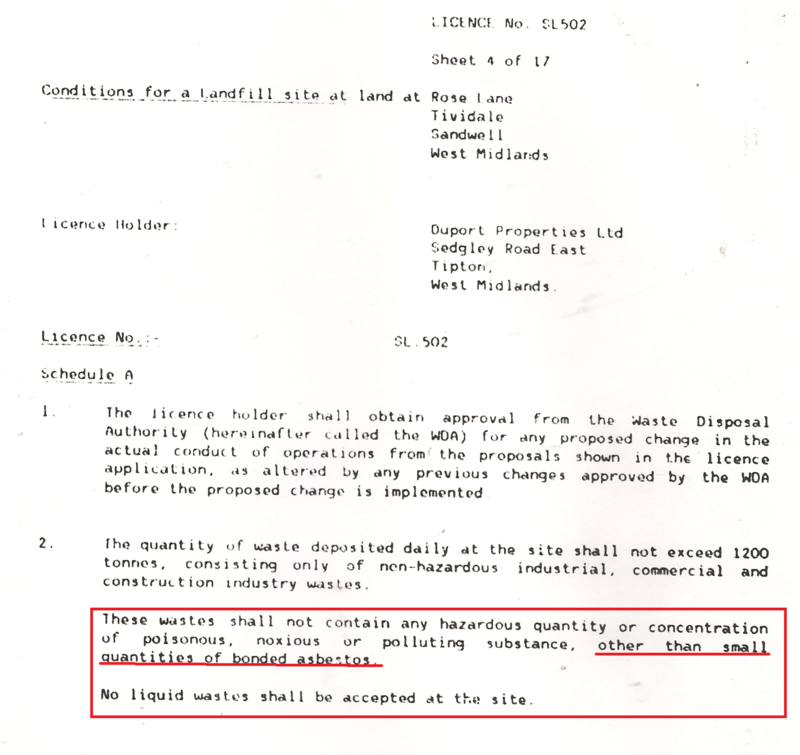 It is not clear as to whether this “agreement” had been one sanctioned by WMCC or anyone else, or even what Duport Properties Limited had been tipping, given their previous lack of attention for specification regards scrap waste! 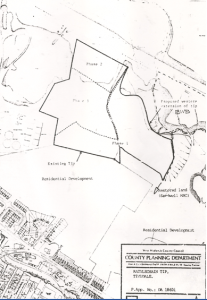 It is clear that this application was to provide one of the first in a long line of controversial decisions from an existing residents point of view. 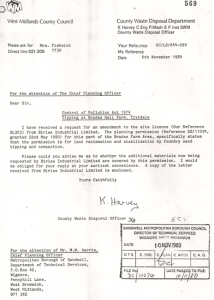 A letter from K.J Brateley Acting Waste Disposal officer WMCC to Malcolm Harris offers an indication of how they were being affected, as well as the new proposed site licence to cover this area- SL502. 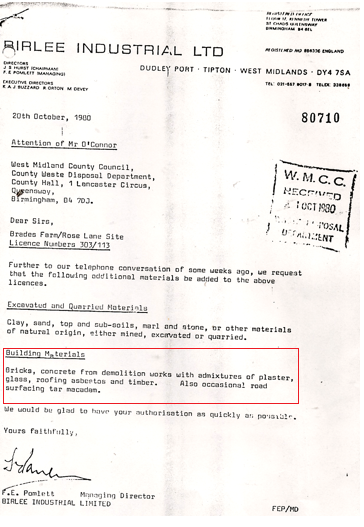 Remember this in light of the fact that West Midlands County Council had NOT excluded waste containing asbestos being tipped across the site! 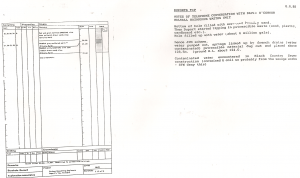 The prospective licence referred to as SL502 was prepared and the waste types approved. 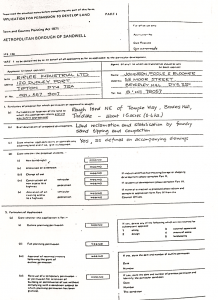 We asked for this in a freedom of information request to Sandwell council, who claimed that correspondence later indicated that Duport Properties Limited had in fact not carried through with wanting to initiate it. 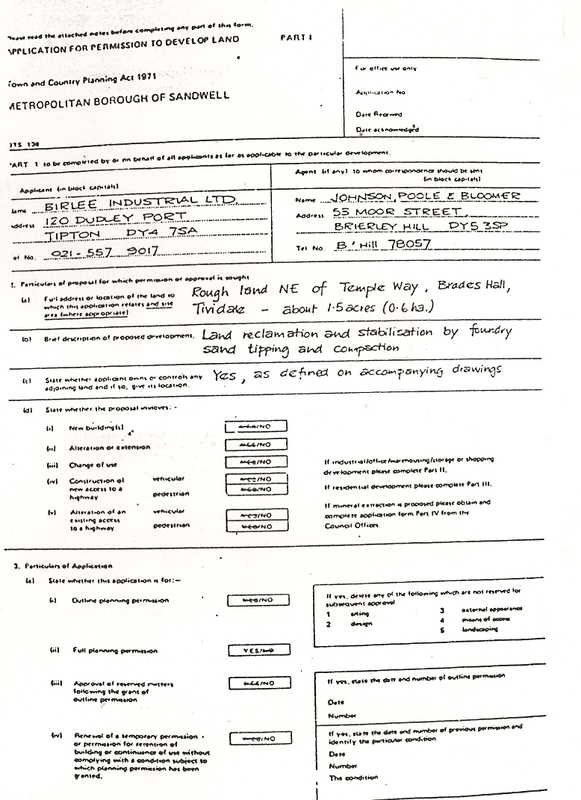 BUT THE PLANNING APPLICATION (DA18601) FOR THIS LICENCE WAS APPROVED. No quantities of hazardous material approved- oh except “BONDED ASBESTOS”! 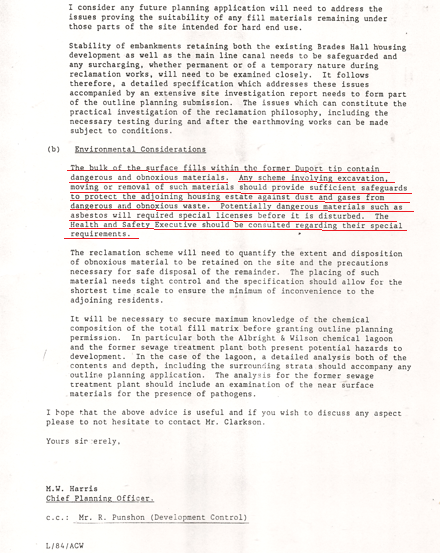 The sanctioning by WMCC for this licence just appears to confirm that The Control of Pollution Act, which supposedly was to stop the wanton dumping of substances hazardous to health was in fact not worth the paper it was written on. The conditions for the planning application can be read below. 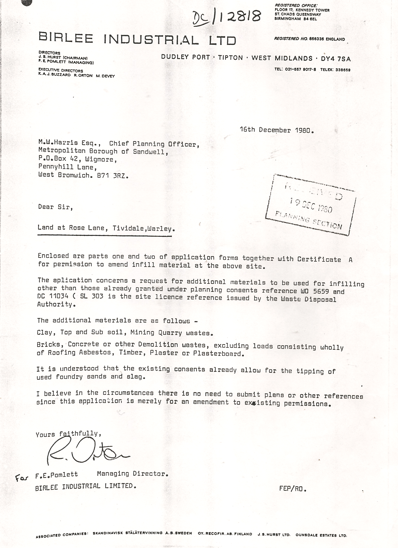 Three phases of filling operation were proposed in the permission granted on 17th January 1986. 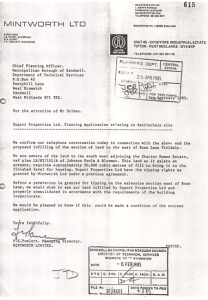 It is only with the benefit of a few years passed that we become aware of what happened with this application and how Duport Properties Limited appear to have abandoned the area altogether. 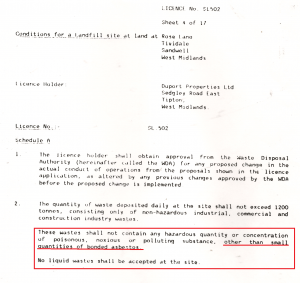 There is contradiction in what Sandwell council claim to be the case regards the site licence- as liaised with The Environment Agency. 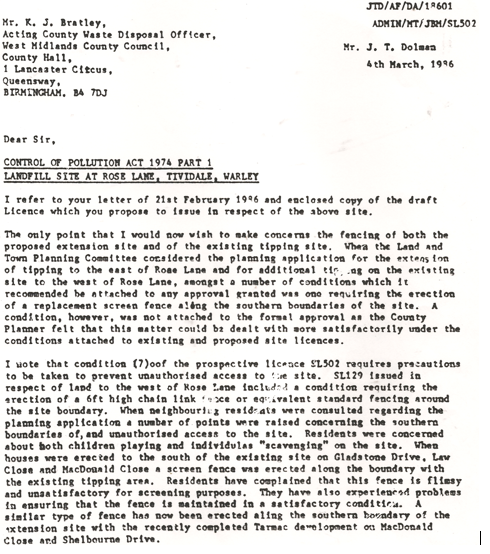 We are aware That Sandwell council itself tried to purchase the site using a derelict land grant in 1986. “Williams Holdings”, became the convenient name for which Duport dispensed with their toxic assets. The Sandwell council deal obviously never occurred. the need to reinstate the tip surface and for dealing with site generated effluents. So let’s just repeat that statement- the site was being used as “a commercial tip” and the West midlands County Council, which thankfully disappeared in 1986 were totally liable for this absurd misuse. Contaminated water found in Black Country sewer construction , which crossed the site contained E.coli. It was inferred that this came from the sewage works itself , though they denied this- but with the uncontrolled nature of wastes it is not unlikely to have been deposited by someone on the site itself directly. One shakes the head in disbelief at these statements, and how the site licences were a total and utter joke. 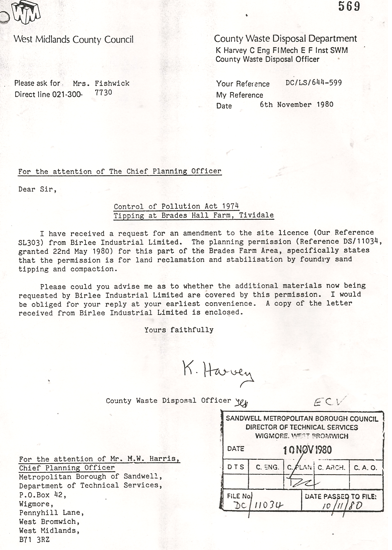 A letter from M.W Harris of Sandwell council to the Black Country Development Corporation discusses the Duport’s tip as it stood as at 18th April 1989. “I have been aware of tipping on the site over 16 years, no control was exercised over the materials deposited or placement of those materials. 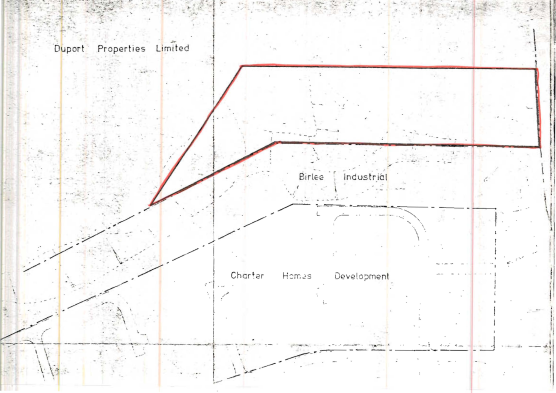 My staff have been in a prime position to witness the site operations and because they were concerned about the eventual possibility of development, pictorial records have been kept of the various phases of filling the site from 1973 onwards. 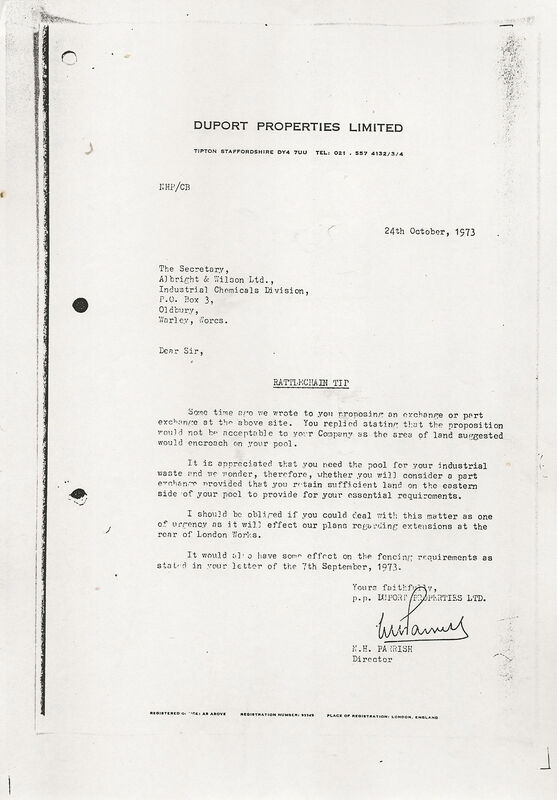 Duport Properties Ltd and Duport Services Ltd dissolved 7/6/91 along with Duport Property Developments ltd, thus the polluter had not paid a penny towards the remediation of the area. Someone should have been prosecuted for the manner in which this site became an unsanctioned, unregulated toxic hazardous waste dump. All those serving on the West Midlands County council from the incompetent Ken Harvey and those who followed him, and the councillors who nodded their heads like dogs should hold them in shame- because one can have nothing but contempt for their decision making and lack of scrutiny as to what the hell was occurring from such a “commercial” cowboy tipping operation- much of it illegal. 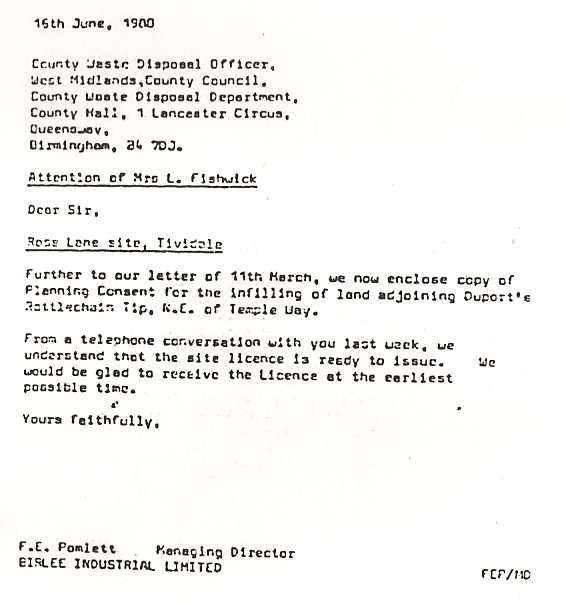 It is no use anyone trying to claim that Birlee industrial who became “Mintworth” were not party to all of this and unaware of it. Duport Properties and their activities, as has been demonstrated were directly linked throughout this period and they shared land, legal advisors, as well as consultants during this period. One has to seriously question the professional integrity and morality of Johnson Poole and Bloomer as a consultant at this time for participating in such a shambles of environmental pollution. They are equally culpable. Unfortunately , things would little improve into the 1990’s. 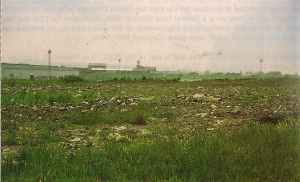 Former brickworks site Circa 1990- How could an area that once contained a natural material- marl be turned into a toxic wasteland with litter strewn rags and bones?